All our painters and decorators come to you fully qualified, highly skilled and with a wide array of experience in all elements of the painting and decorating trade. We’re friendly, clean, tidy and meticulous and attention to detail is at the top of the list for everyone in our crew. 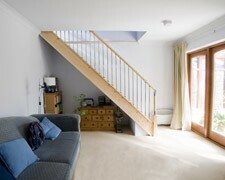 With us, you can be assured of a really good finish, no matter what room you ask us to work on. We give all customers a free, affordable and no obligation quote and will always work at a time that is most suitable for you. If you would like to know more, would like a quote or have a question, please contact us on Leeds 0113 370 8828.